Red Door in Greenwich is a great escape from the bustle of the busy streets surrounding it. Although it was crowded when we visited, it was still possible to find a table and have a conversation without too much background noise. I had heard good things about Red Door and wasn’t disappointed. 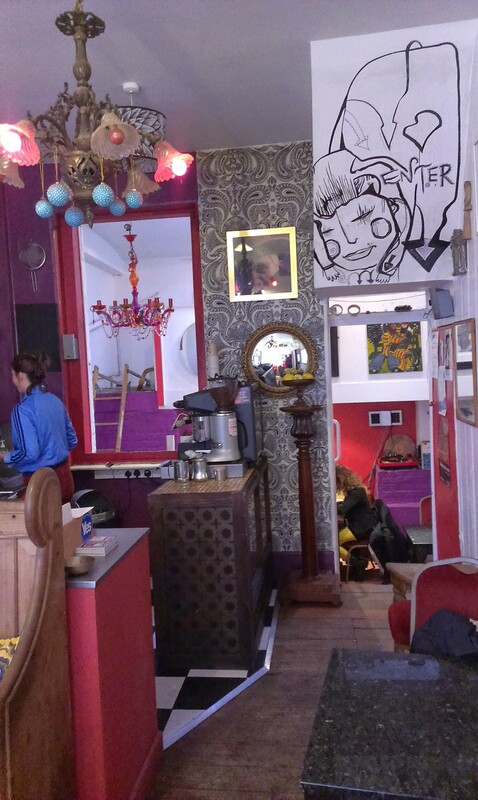 Good coffee (from Monmouth), nice cake and warm surroundings. Definitely a place to go to when in Greenwich. 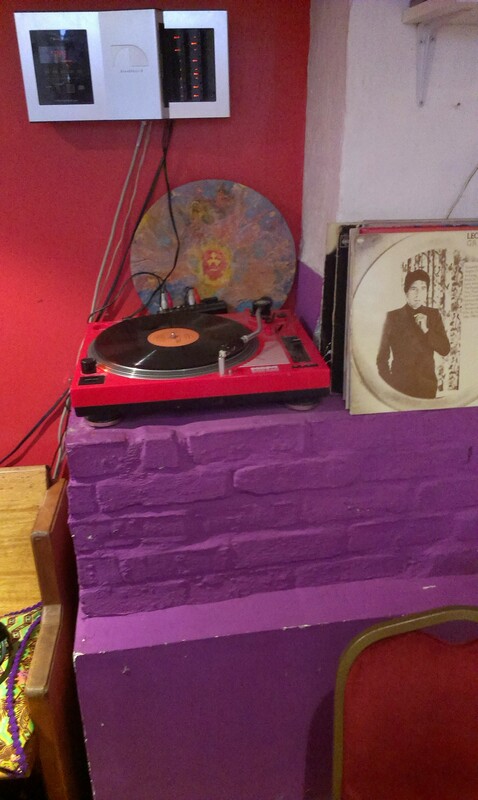 The music that was playing was coming from a record player in the corner. A proper turn-table playing vinyl records. Suddenly, there were so many possibilities for stories for a Daily Grind article. There was the fact that records are analogue based (as opposed to the digital CDs), or perhaps I could write about the physics of a valve amplifier and how it relates to the evaporation of water from coffee (some of the physics is very similar). However what I started to get obsessed with is: what would happen if you put a coffee on a record player? Now, I am an experimentalist and I do have a record player at home but before I could say “what would happen if…” my plans for experimentation with the record player were blasted out of the water. So I had to make a model record player out of a rotating spice rack. This probably worked better as I could control the speed of rotation, though it did make taking photographs tricky. So, what would happen if we put a coffee at the centre of a turntable? The movement of fluids in cups and on record players is extraordinarily complex and is indeed very far from my ‘area of expertise’. However, we can start to understand what might be happening in the cup by making some approximations. Our first approximation is that the coffee in the mug rotates as a ‘rigid body’, meaning that it rotates as a whole. As the coffee cup rotates about its central axis on the “record player” the coffee inside the cup will (eventually) also rotate at the same angular velocity (speed of rotation). The fact that there is a rotation means that there is a force acting on the particles in the coffee liquid. This force produces an acceleration that increases with increasing distance from the axis of rotation. Each coffee particle is of course also subject to the vertical action of gravity. The combined acceleration means that each particle is simultaneously being pulled downwards and inwards. As the acceleration due to rotation increases with increasing radius, the horizontal acceleration becomes increasingly dominant away from the centre of the cup. 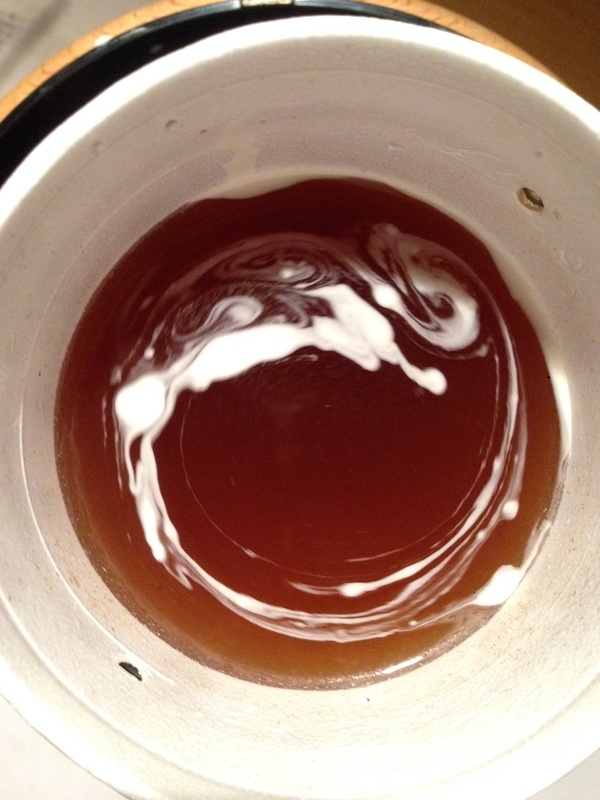 This leads to the familiar curved surface (a dip at the centre of the mug) that we see with rotating fluids. This polystyrene cup was rotated about its axis before being stopped. The water inside continues to rotate causing turbulent layers at the edges. These have been visualised with a small amount of blue ink. Yet we know that this cannot be the full story. If we suddenly stop rotating the mug, the coffee in the mug continues to rotate for a while but does not do so indefinitely; it slows down. We can understand this by refining our approximation that the coffee inside the mug rotates as a rigid body. In fact, the coffee is a viscous liquid and the viscosity means that the layer of coffee immediately adjacent to the mug walls will move at the same speed as those walls: Stationary wall, stationary coffee. The coffee towards the centre of the cup meanwhile continues to rotate for a while. Imagine suddenly stopping the record player so that the mug is now still but the coffee inside continues to spin around the central axis. Stress is being produced between the stationary ‘layers’ of coffee next to the mug wall and neighbouring ‘layers’ of rotating coffee. This stress leads to turbulence. We can make this turbulence visible if, instead of coffee we use a mug of water. Rotate the mug of water as before and then suddenly stop the mug rotating. As with the coffee, the water continues to rotate. Now drop a tiny amount of water soluble ink or food colouring into the very edge of the water (I used a cocktail stick dipped in ink and held against the mug wall so that a small amount dripped into the water). 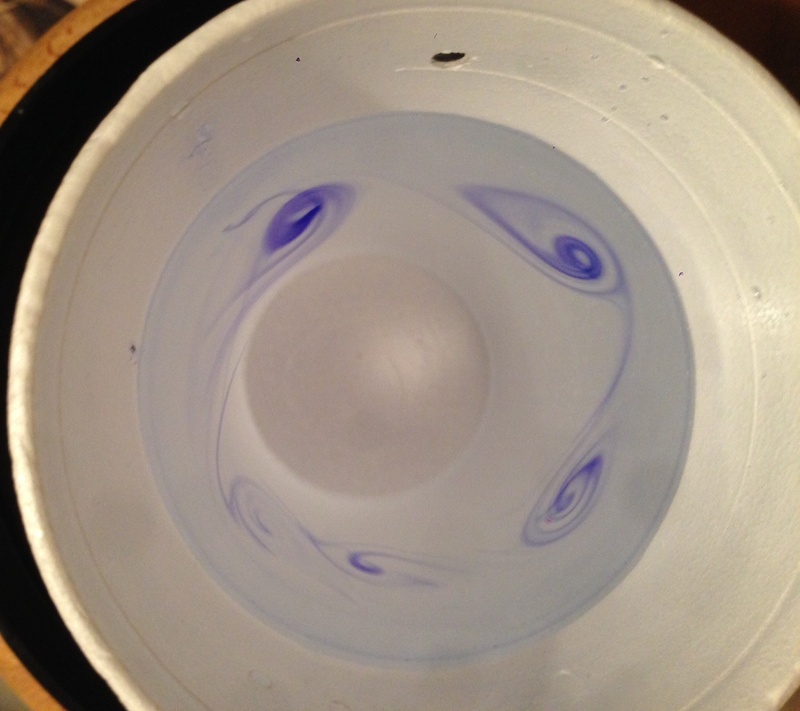 As the water continues to spin, the ink is caught up in the turbulence and the vortices it produces can be seen. These concepts of boundary layers and turbulence are important for many applications including weather systems and car design. We need to understand how liquids (or gases) flow past each other in order to predict the weather and we need to know how they flow past solid objects in order to make cars more aerodynamic. In the coffee however I think that this turbulence is one of those things that is worth just creating and appreciating. A great demonstration of beauty, art and science in a mug of coffee. Please do share your pictures of these coffee cup vortices if you manage to create them, particularly if you are able to see the effect with cream in coffee. You could either write about your results in the comments section below or email me photographs of your coffee and I will include them on this page. As always, enjoy your coffee. My thanks to Kate & Edward of Red Door for sending me the photos of Red Door. An attempt at visualising the vortices using cream in coffee. Not so successful though you can see at least 2 well defined vortices in the top left of the image. Introducing the second liquid right at the edge of the mug seems critical, not so easy with cream as it is with ink!